Agile means iterating to see what works, not focusing on a set plan and seeing it through to the end. This should sound familiar to any marketer, since it’s the same idea behind the benefits of making multiple drafts for your content, recording several takes for a video voiceover, and even A/B testing in general. Despite not being an agile system, traditional marketing structures use these principles in various projects. The difference with agile marketing is in your planning and the application of those plans and projects. With traditional marketing team setup, you lean towards a waterfall system. That is, a project gets planned thoroughly and taken through the various steps to completion in sequence with little deviation. Agile marketing, meanwhile, focuses more on immediate deadlines and getting things done without the need for perfection. A project gets planned, broken up into steps, completed as quickly as possible without sacrificing quality, then the team moves on to the next project. It doesn’t matter if something isn’t perfect – you can always iterate on it later. While this might sound like an inane differentiation, I’ll show you just how different an agile marketing team is set up in their regular work. In other words, here’s how the Process Street marketing team hits their goals. The points system is the reason we’re able to have an agile marketing program. By taking the sprint setup that’s common in agile development teams, we’re able to split each month into 35 points worth of work for each employee. This means that every month should have a similar amount of work in it, since the points are assigned to projects based on a combination of how difficult the task is expected to be and how long we think it should take. In other words, it lets us easily control and predict how much work will get done, and when it will be completed. Taking the 35 points per month and the average number of working days being around 22 per month, the value of each point works out to roughly 0.63 days. That means that (roughly) 1 point = 5 hours. While some projects are difficult to predict in terms of points, there’s always room for reflection in our sprint retrospective meeting. Our pre-planning call is a meeting between the heads of our marketing team in which we set up the basis for the sprint. Enough blog and guest posts are collected from our ideas section and accepted pitches, paced throughout the month’s calendar, and assigned to various team members to space out the deadlines evenly. The person responsible for planning the sprint is on a cycle, meaning that one month it might be my colleague Adam, while the next month will be my turn to select the posts and guest posts. This doesn’t change much in practice (all of us collaborate on what our priorities are) except for who shares their screen during the Zoom call when it comes time for the pre-planning. We usually have the pre-planning around a week and a half before the next sprint starts, which gives us plenty of time to adjust our projects based on what happens at the end of the current sprint. For example, if a project isn’t completed but is still top priority, there’s enough flexibility to slot it in the beginning of the following sprint. As for why it’s a call rather than an in-person meeting, we’re a fully remote team. For some, this is an issue but we’ve actually found that it helps motivate us to get everything done and sorted within the hour-long meeting we have. A couple of days before the end of a sprint we then have our main sprint management call. This involves the entire team and serves as an open field to explain what our priorities are, what everyone’s tasks and deadlines will be, and to answer any questions our team has on the upcoming sprint. There’s no real secret here – the sprint has already been planned, so now it’s just a case of walking everyone through the next month of work and making it clear why it matters. It’s a great opportunity to show our team how all of their projects are connected and give them a reason to care about what they’re working on. After all, it’s much easier to focus on a project if you understand and believe in why it’s important. If anyone has issues with the points values assigned to them, has a project that they want to put forward, thinks we’ve forgotten a task or plan wants to ask a question about their work, this is where we clear the air. That way we can all go into the next sprint knowing exactly what we need to do and who to talk to if we have any trouble. The sprint retrospective comes roughly a week after a sprint has finished. It’s another call with only the heads of the marketing department, and serves as a way to summarize what happened in the last sprint, take stock of everyone’s total achieved work, and so on. The person who organized the sprint before it began is the same one who tackles the retrospective. For example, if I planned out the sprint for January 2019 (which I did), I would also be the one who has to assess it the week after it’s done, clear up any unknown information, and host the retrospective meeting. This way we can see whether someone has been struggling in some way (through a lower point total), performing above expectations (through a higher point total) and how the month went in terms of progress in general. 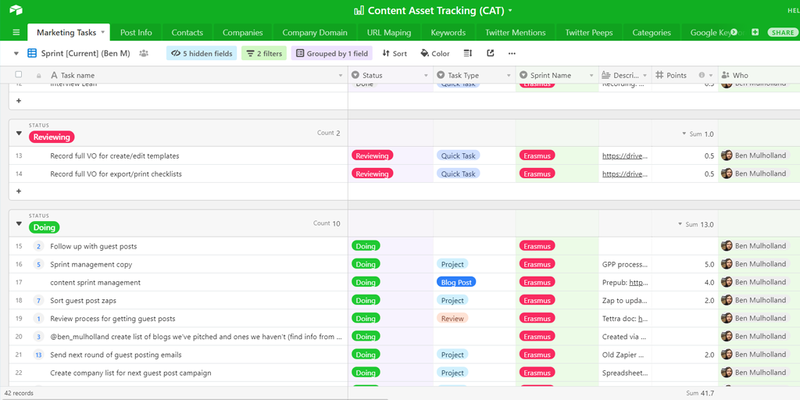 So far we’ve avoided the obvious problem with our agile marketing setup – you need one hell of a tool to be able to effectively manage your sprints. Whatever you use needs to let you assign tasks and projects, fill in details such as their type, points value, due date, and so on. Tools like JIRA and even Trello can serve these needs perfectly fine. The trouble comes with integrating that tool with the rest of your marketing stack. Think about it – the vast majority of the tasks your team performs are going to create, depend upon or relate back to important marketing data. Blog posts should be documented, keywords recorded, and ideally everything should be interlinked to let you easily navigate your data as needed. That’s why we use Airtable. 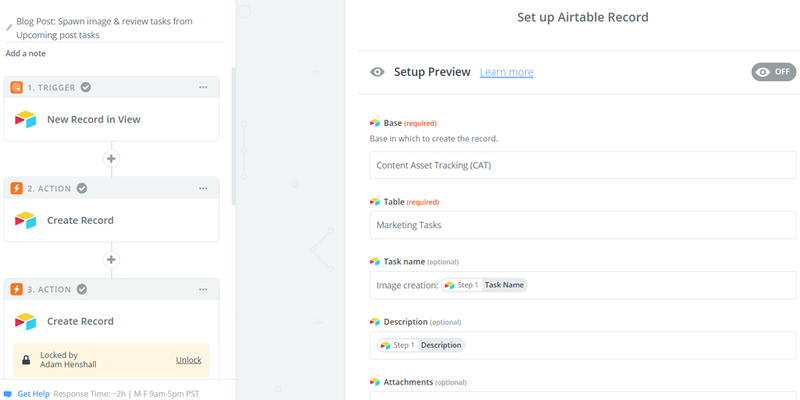 In Airtable, most of our tables are dedicated to storing data to make it easy to find what we need. We have separate tables for post information, keywords, contacts, and so on. However, we also have one that’s dedicated to our marketing tasks. This is where we manage our sprint. The table being separate from our data entries lets us create, assign, and manage tasks as needed without the danger of affecting our records. However, these tasks can be linked to their relevant data counterparts to let the person working on it have all of the information they need in the same entry. 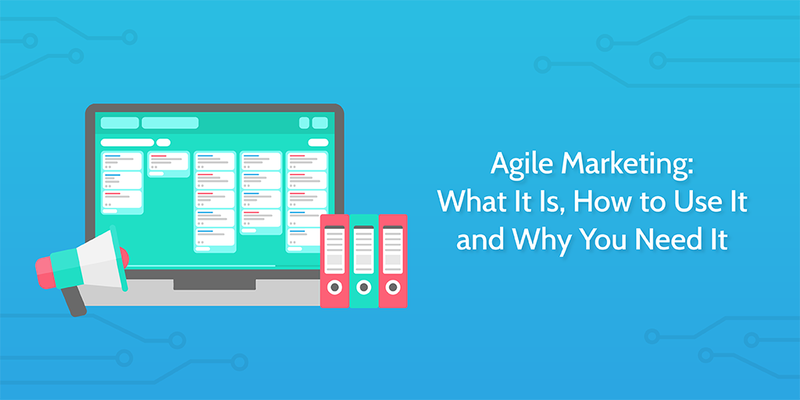 Another key part of the idea of agile marketing is holding frequent meetings to monitor the progress of tasks as they move along and adapt to changes as necessary. In this way the space between each meeting is almost a mini-sprint in itself, letting our team adapt to changes and problems as they come rather than being stuck in a given practice. Software development teams use daily standup meetings to consistently monitor progress, keeping each meeting to around 15 minutes to avoid spending too much time on them cumulatively. Due to the slower nature of content creation, however, we pace things out a little differently. We have two hour-long meetings that involve the whole team per week, with the opportunity for anyone to arrange a shorter call with one of our team leaders one-on-one to discuss a project. That way everyone has the time they need to focus on their tasks and get into their own writing flows without having to worry about having meetings every day. Plus, by putting our Calendly links into the description for our Slack profiles, anyone can look at our available times and book a meeting for whenever suits them. Equally, this also means that if anyone is having problems there’s already an extended meeting set up for them to voice their concerns. They’re not limited to a 15-minute time slot, which allows the head of our blog to discuss topics with them in-depth. It’s all the structure of a sprint management system, with the flexibility required to let our writers work in the way that best suits them. Iteration is a vital part of any agile system, and our marketing team is no exception. On a small scale, our scheduled meetings (and one-on-ones) let us address small problems as they appear and adapt on the fly. However, the real kicker for iteration and process improvement, is our sprint retrospective. The retrospective lets us look for any larger problems which need addressing to avoid them happening again. 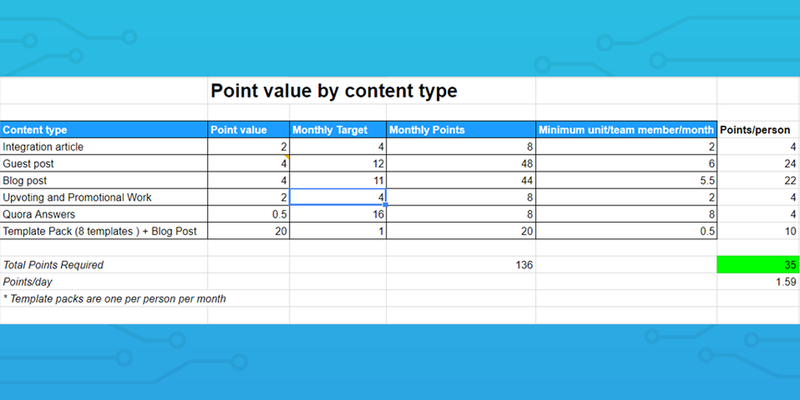 If someone was assigned too many points, we know that we need to reassess their original assignments and account for tasks that are likely to be added as the month goes on. Equally, if one of our processes has shown to be lacking, we can make note of which one, make a task for it in the next sprint, and assign it points and a team member accordingly. One of the biggest projects we undertook in terms of process improvement was when we first started using the sprint management system. It took us far too long to create and assign tasks for the next sprint, and we inevitably made mistakes with the level of detail that had to be manually entered for each and every new task. That’s where business process automation came in. Process automation let us save an ungodly amount of time in arranging our sprints. It also doubled up by making sure that the tasks we usually created by hand were correct and fully detailed 100% of the time – no room for human error. By linking our apps together with Zapier, we were able to automate the vast majority of our task creation duties that are involved with sprint management. This means that we have more time to assess valuable projects and work with our team to make sure that everyone is happy with the workload they’re being assigned. Basically, it’s easier for everyone to complete their tasks without interruption, and there’s no reason why anyone can’t get their work done. We used to run on a system of assigning projects, giving a final deadline, then letting people get started. Looking back, it’s a wonder how we managed to last as long as we did (although our small team probably had something to do with it). Our old system left us largely unable to tackle large-scale and/or long-term strategies and projects. The only reason we were able to function effectively without a well-structured sprint system was that our team had a whopping three members for around 2.5 years. The agile marketing system we now have makes it not only easier but possible at all to keep track of what everyone’s doing and take immediate action if someone’s having trouble. Whether you’re in an office or remote environment, that’s a damn powerful thing to have. How does your marketing team manage themselves? Let me know in the comments!